The invention of the crowbar was both a blessing and a curse. It's fantastic versatility in working on everything from providing a lever to hooking and pulling out nails has made this useful tool an indispensable accessory to toolboxes in auto shops, construction sites, and homes everywhere. On the other hand, this diversity and adaptability also makes it much easier for criminals to break into homes with as well as use as a weapon. It's like a metal baseball bat that can also break safe doors and pry windows open. 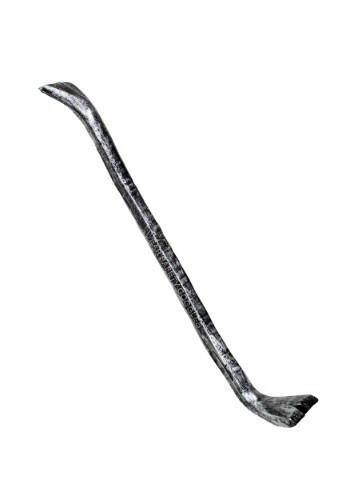 We try to turn all curses into some form of blessing though so if you're looking for a sweet safe accessory for your bad guy costume, why don't you try this plastic crowbar replica on for size. It's looks just like the real deal except you can actually bring it in to your next big costume party or comic convention without scaring everybody away or being kicked out. Look at all those wins in one place and not a single home had to be broken into.